Reuters has exposed how Philip Morris International Inc. (PMI) and British American Tobacco Plc (BAT) lobbied Pakistan’s government to not implement bigger health warnings on cigarette packs, in what officials say was part of an industry-wide campaign that successfully persuaded Islamabad to water down a proposal designed to save lives. The Reuters’ investigation exposes how the Prime Minister’s office and the Ministry of Finance were lobbied to water down a requirement to increase the size of health warnings, from 85 percent of the cigarette pack to 65 percent. In letters written by Philip Morris executives to the Prime Minister’s Office in 2017 and internal company documents describe a meeting in 2015 at which executives discussed “protecting the pack” in Pakistan. Central to PMI’s tactic is the US-Pakistan Business Council (US-PBC) which was used as a platform to influence tobacco policy on illicit trade, a reference then utilised to exert influence on graphic health warnings on cigarette packs. This exposé stresses the need for a whole-of-government approach to enforcing FCTC Article 5.3 guidelines and good governance such as transparency in tobacco control. Using the business platform to promote the tobacco industry is also a big problem in the ASEAN region. PMI uses the US-ASEAN Business Council (US-ABC) to gain access to top level government officials – a perennial problem for many years. The table below lists the US-ABC meetings just these past three months held in Indonesia, Malaysia, Philippines and Vietnam where PMI met with the top leadership. PMI and its allies frustrate government efforts to protect public health by opposing tax increase for tobacco with scaremongering that it will exacerbate smuggling. It funds studies such as the Asia Illicit Tobacco Indicator (now done by Oxford Economics) which provide flawed data and recommends working collaboratively with the tobacco companies to tackle illicit trade. This runs contrary to the obligations under FCTC Article 5.3 guidelines. At the March meeting in Hanoi, US-ABC expressed how “U.S. businesses can support the goals of the government and strengthen healthcare in Vietnam” and that it values “strong cooperation and regular engagement on health between the American businesses and the Government of Vietnam …” This is disastrous for tobacco control since PMI has a new pretentious support for smoke-free as seen by its ‘sick joke’ when it called for a smoke-free future while aggressively marketing cigarettes worldwide including in Vietnam. As Parties to the WHO FCTC, clearly governments need to act in a cohesive whole-of-government manner to reduce tobacco use. The trade platform has been particularly vulnerable to tobacco industry lobbying and has been used to fight tobacco control efforts. PMI’s call for ‘smoke-free’ is duplicitous and must be condemned. 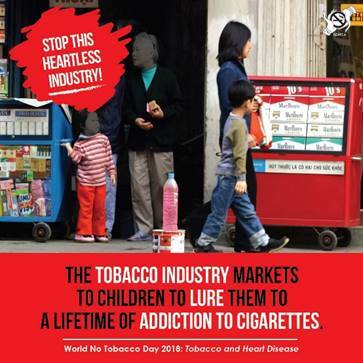 The tobacco industry is heartless and must be stopped.